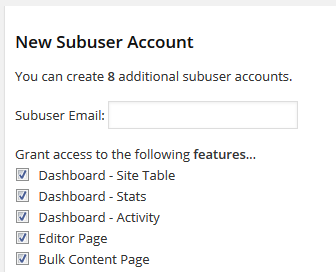 I am happy to announce that today we have released an update that adds one of the most commonly requested features to CMS Commander: The ability to add subuser accounts to your own CMS Commander account. That means you now have the ability to easily share access to your site management account with coworkers or clients of yours. Even better: For each subaccount you create you can restrict their access to specific management features or websites in your account to control what exactly they can do. By doing that you can for example give client A access to manage his group of sites in CMS Commander and client B access only to her sites. All other sites are not visible for said clients and can not be accessed by them. Another example would be for a business to grant access to an employee to the “Post Editor” page only, so that he can create new posts on all managed sites but can’t see the backups, clone or other pages inside CMS Commander. As you can see there are lots of possibilities here that will make it much easier for larger businesses and organizations to effectively use CMS Commander for managing multiple WordPress sites. All CMS Commander premium accounts with the exception of our smaller plans up to 10 sites include a free free allowance of subuser accounts. For more details on the exact numbers please take a look at our new pricing page. If you need more subusers you can either upgrade to a larger plan or alternatively increase the limit by ordering one of our new subuser account addons. The price for 20 additional users is $9 per month and for larger amounts there are further bulk discounts available. Please note that subuser accounts are not available for free or trial accounts. 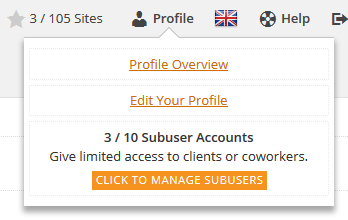 Hover over the “Profile” link at the top right of your dashboard screen and then click on the “Manage Subuser Accounts” button in the popup that will open. This will bring you directly to your new subuser page, where you can create new sub-accounts and manage existing ones. To create an account all you need to do is enter the email of the new account holder. The password will be sent to this address after creation is complete. Optionally you can restrict the access of the new subaccount to specific CMS Commander features and/or to a specific group of sites in your account only by using the following form fields. After you have created your first subusers you can find a list of all accounts connected to your CMS Commander at the bottom of the page. Included is the possibility to delete any accounts that are not needed anymore.